This subdued passenger compartment lighting improves visibility inside the vehicle in low lighting conditions. 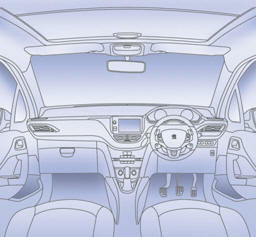 It comprises several lamps, located below the instrument panel, in the footwells, in the courtesy lamp and on each side of the panoramic sunroof. This gearbox provides driving that combines a completely automatic mode and a manual mode. After setting the desired level of comfort, the system then automatically controls this level according to the ambient conditions.